This page is dedicated to sharing the thoughts and experiences of our Buns' new families. If you have a Hot Cross Bun and want to share an update, picture, or any exciting news, this space is for you! We already have pictures of Blackberry enjoying life in her new home! Here's one we want to share with you all. :) We are definitely missing this little girl but are thrilled for her and her new person who adores her already. January 30, 2019 - Do you remember Peggy, the little tripod doe out of Batty's litter? We received a wonderful update to pass along to all of her fans. She is everything her family wanted and is doing really well with her life in Cincinnati. She is still tiny (only 1.8 lbs.) and was recently spayed. She loves oats and fresh basil, watching Fixer Upper (yes, she actually lays down, facing the screen for the entire episode! ), burrowing under her hay and blankets, and her red snak snak activity log. 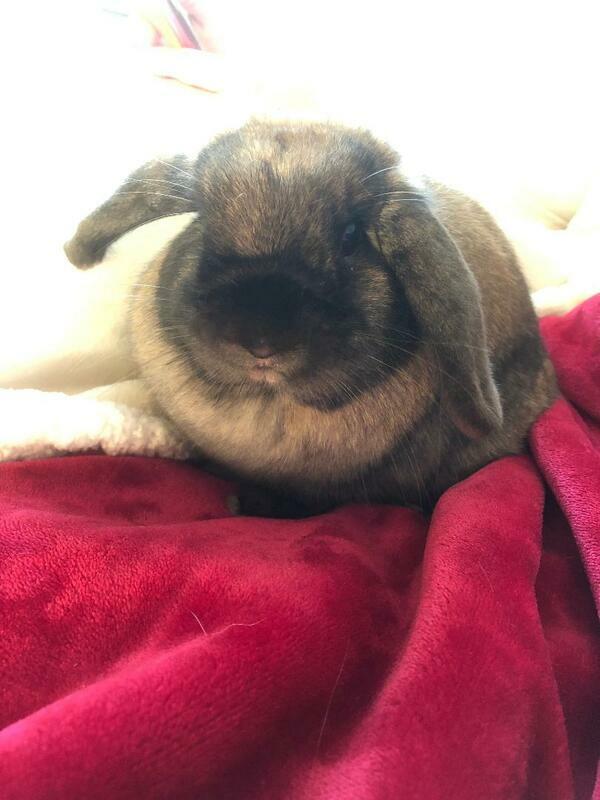 She has gotten her two (previously rather unsociable ) French lop brothers, Hopscotch and Butterscotch, to be more involved in family life and share in the affection. Peggy has even learned to do two tricks! She can spin in a circle and hop through a small hoop. We are thrilled to know that Peggy is doing so well and that her sweet, sunny disposition is bringing such joy to her family. Thank you so much for the update. Katy & Erik! January 2019 - We received an update on black tort doe Momo, who was called KitKat in her Hot Cross Buns days. She was recently spayed and is doing very well. Since spaying, she has calmed down and is more comfortable with being picked up and cuddled for a few minutes at a time. Momo loves running around in the living room and keeping her human mama, Bella, on her toes. She has grown up to be such a big, beautiful girl! Than you for the update, Bella! August 12, 2018 - Sharing some pictures of Hot Cross Bun Sam in his new home. 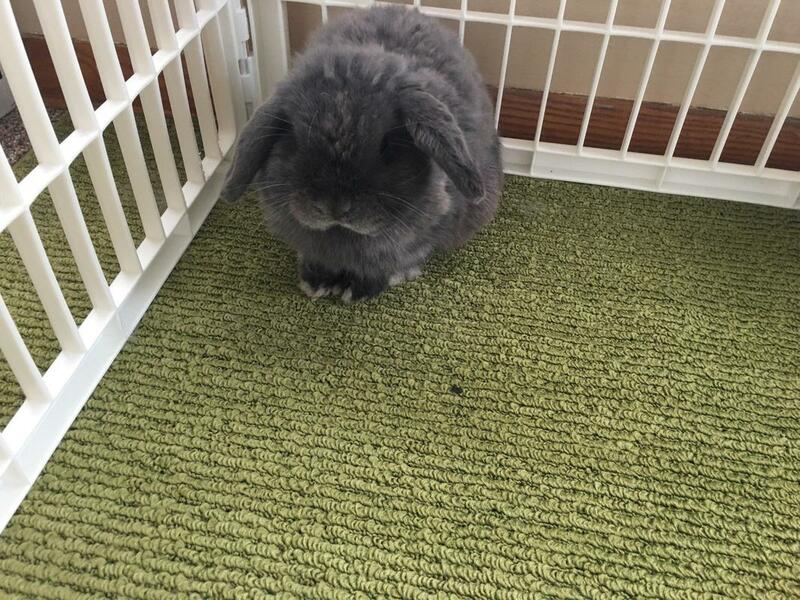 Sam is waiting to be officially introduced to his new bunny friend, three year old black tort doe Olive. He has about 10 more days before the slow face-to-face meetings can begin. We are looking forward to hearing how they do with the bonding process and are praying for a happy outcome. May 24, 2018 - Wonderful news and pictures have come from Angela about sweet Khalessi (a Hot Cross Bun herd doe formerly known as Babette). She is doing beautifully with her new family and has made a loving friend to Angela's four-year old son. There were some very concerning moments surrounding Khalessi's spaying, as she took longer than normal to start eating and perking up again. The vet discovered that her uterus showed signs of being pre-cancerous, but she should be just fine. This is another reason why we continually stress the importance of having pet does or retired breeding does spayed as quickly as possibly for their continued good health and well being. Today, Angels wrote: "Khalessi is spending her day with my sick 4 year old. She is always involved in super hero playing. Usually she ends up being the bad guy that keeps beating up and knocking over or carrying away the superheroes. Figured I would send this your way for your website." Cassie also gave us a very nice recommendation. She said, "The best thing we could have done was go to you and your family for our bun. Ameera has no fear of anything, she loves excitement, she loves people, and she loves other animals. I don't think we would have gotten that if we would have gotten a bunny from somewhere else." We absolute love this picture of Doodles, submitted by his doting owner Sharon K. Doesn't he look like a plush stuffed animal, posed by the window? Too adorable! Rachael S. wrote to let us know that all went well following Cece's spaying earlier this month. Rachael also spoke in glowing terms about Dr. Keith at Healthy Pets of Lewis Center in Columbus, and her awesome bunny knowledge. We love a great bunny veterinarian recommendation! She included some adorable pictures of Cece to share, as well. #1 Cece wearing her post-spaying, incision protecting t-shirt. the right bunny with the right family. It’s obvious Hot Cross Buns want to make sure their bunnies are placed in the appropriate home for them and that both the bunny and new family are happy with each other. wouldn’t hesitate to get another Hot Cross Bun." Mary R. shared this photo of Theo (formerly known as Macaroni Joe) with us and we are finally getting around to sharing it. It makes me laugh because it shows the sulky teenaged buck stage so perfectly. Here is Theo, hiding in his "Man Cave". Theo will be getting neutered over the Christmas break, so perhaps he heard Mary making the appointment. Sharon K. sent these wonderful pictures of Doodles who has learned all sorts of wonderful new tricks in the past few weeks he has been in his new home. She has been corresponding faithfully, keeping us updated on Doodles' ups and downs as he settled in. We are happy to be able to say that his progress has been wonderful and that he is one happy and blessed little boy. :) Thank you for sharing the pictures and good news, Sharon! "As a novice bunny owner, I was nervous about making a 10+year commitment without knowing a lot more about them. I spent time reading on various internet sites, then started to get serious about finding a rabbitry nearby for the actual purchase. I read a LOT of sites over several weeks, but I kept coming back to Hot Cross Buns because of the way Amy and the team talk about their bunnies. Like the other rabbitries I explored, they certainly raise high quality Holland Lops that conform to breed standards and are therefore suitable as show, breeding, and/or pet bunnies, but in addition, they are absolutely committed to producing bunnies with sound temperaments, too. Best of all, the site made it clear that the happiness of owner and bunny are equally important: not everyone thinks all that much about whether their animals are happy, so this was important to me. "I started corresponding with Amy and, after getting to know her and the available bunnies virtually, I made the four-hour drive from my home in Michigan to meet the Hot Cross Buns. I have never regretted a single inch of that drive. Amy had selected four bunnies whose temperaments were more to the mellow end of the spectrum, which we agreed would work best in my household. I held each one and watched them play in the bunny room, but it was clear to me from the first that Theo (then Macaroni Joe) was MY bunny. Even after I brought him home, Amy has continued to patiently (and very knowledgeably) answer questions and direct me to excellent sources of information. 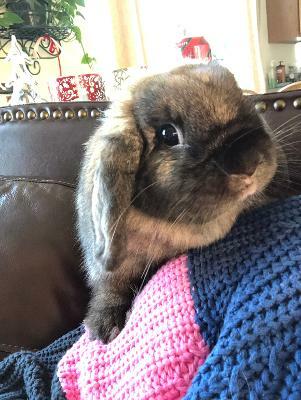 Because he was handled and socialized appropriately as a young kit, Theo is utterly comfortable with strangers and laid back in his surroundings: a well-adjusted, happy bunny. "If you're interested in working with a rabbitry that cares deeply about its bunnies and its clients, Hot Cross Buns should be your first (and only) stop!" "I cannot truly thank Amy and the crew at Hot Cross Buns enough. Amy is so incredibly knowledgeable with all things bun related! She really takes the time to match you with a rabbit based on their personality and what will fit best with your family. She was so great and patient with me in choosing my sweet Cecilia. She let me come and hang out with the buns that she thought would be a good fit and when she sent us home we got a toy and blanket along with a huge bag of transitional food and hay. I am so grateful to have worked with someone so loving, she is always available to answer my questions and concerns I have. The whole process of working with Hot Cross Buns from the beginning was so positive, I came to them after my previous bun passed and I cannot say enough good things about this rabbitry. I will recommend them time and time again. Cece has been such an amazing addition to my family and I'm so happy to have gotten her from such a loving family that truly cares about these sweet animals." Thank you, Rachael! We always love hearing from you!